Before the 7-year-old Hyman Bloom left Lithuania in 1920, he told his rabbi that he planned to become a rabbi himself in America. But settling in Boston, Bloom abandoned his family's Orthodox Jewish faith after his bar mitzvah. 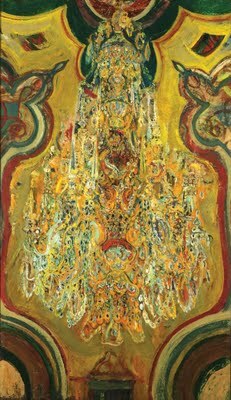 And as the Danforth Museum's exhibit "Hyman Bloom: A Spiritual Embrace" persuasively shows, he sought spirituality instead through theosophy, the occult, LSD experiments, Eastern religions, psychoanalysis, astrology, and, ultimately, his art. Artistic success came early for Bloom: a show at New York's Museum of Modern Art in 1942, the 1950 Venice Biennale, a 1954 retrospective at New York's Whitney Museum. He is considered one of the major Boston Expressionists, with such artists as Jack Levine and David Aronson who became known in the '30s and '40s for their moody, painterly realism. But the Modernist era was one of art manifestos and orthodoxy, and Bloom, like most American artists who didn't strictly pursue abstraction during the heart of the 20th century, was shunted aside. 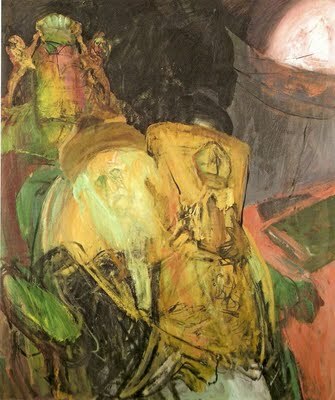 The painter Bernard Chaet has said Willem de Kooning told him that he and Jackson Pollock discovered Bloom's work at MoMA and thought him the first Abstract Expressionist. In lieu of flowers, the family has asked that remembrances in the name of Hyman Bloom may be made to the Vilna Shul Boston Center for Jewish Culture, 18 Philips Street, Boston, MA 02114. Pictured from top to bottom: Hyman Bloom, “Chandelier II,” 1945, and “Rabbi with Torah,” 1999.